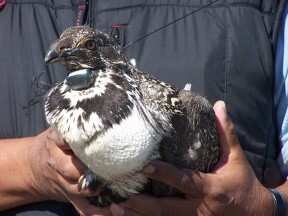 The Greater Sage-Grouse (Centrocercus urophasianus) are an important cultural and wildlife resource for the Yakama people. 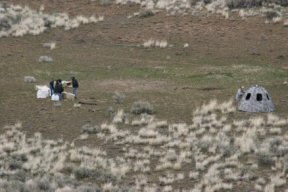 Young tribal hunters were taught stalking techniques with sage-grouse as the quarry. As their skills increased, hunters shifted their focus to larger game such as deer and elk to feed their families and their communities. 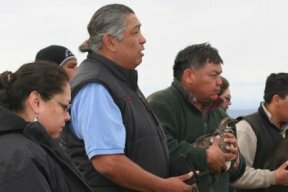 Sage-grouse courtship displays inspired traditional dance of teh Yakamas that continues to be passed down through the generations. With each passing generation, however, these traditions are being lost. 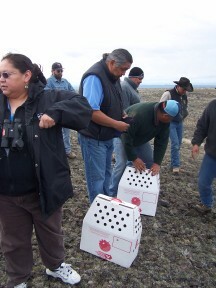 The loss of sage-grouse as a cultural resource has contributed to the slow decay of the Yakama culture. 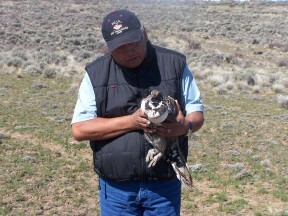 The sage-grouse is believed to have been extirpated from the Yakama Reservation since the 1960's. 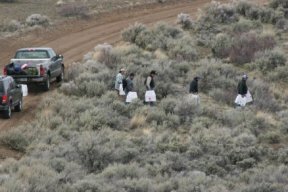 The reasons for their extirpation off the Yakama Reservation was likely habitat degradation largely due to historic sheep and cattle grazing. 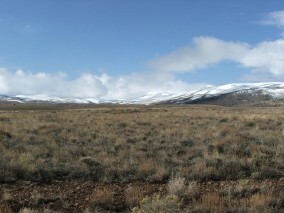 Habitat assessments were done in east Satus in 2001 to assess the suitability for sage grouse. Approximately 1/3 of the assessed acreage was considered suitable for winter and brood habitat. 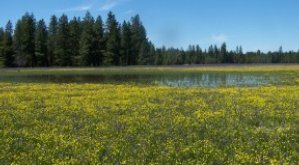 There is currently restoration work being done in East Satus to increase suitable acreage. 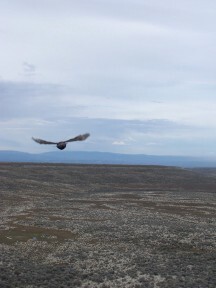 In 2006, our program released 36 grouse, 24 males and 12 females, with plans to release more in August, and in future years. 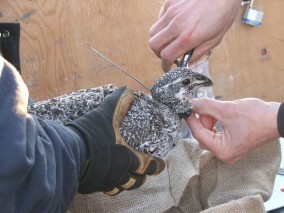 Picture 2 - Sage-grouse receiving radio transmitter. Pictures - Nathan Burkepile (on left), project leader, placing on transmitter. 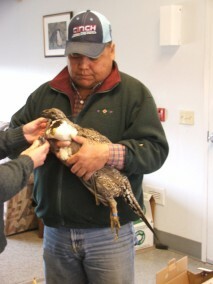 Pictures - Grouse are taken to a release cage, to decrease stress. Pictures - Preparations made for very first release, with one accidental premature release! 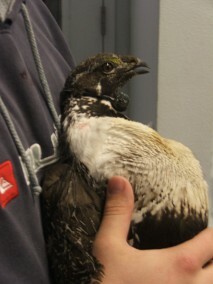 Picture - The final bird is released. Picture 2 - Arlen Washines (Program Manager). 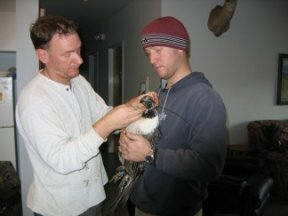 Pictures - Placing radio transmitter around neck, extremely important for finding birds and knowing success of release efforts.